As addicted as I am to the glories of seasonal eating and eating as a paired experience with the weather, I’m thinking about barbecue even though its an icy, crusty winter here in Maryland–and apparently everywhere else above and below the Mason-Dixon line. 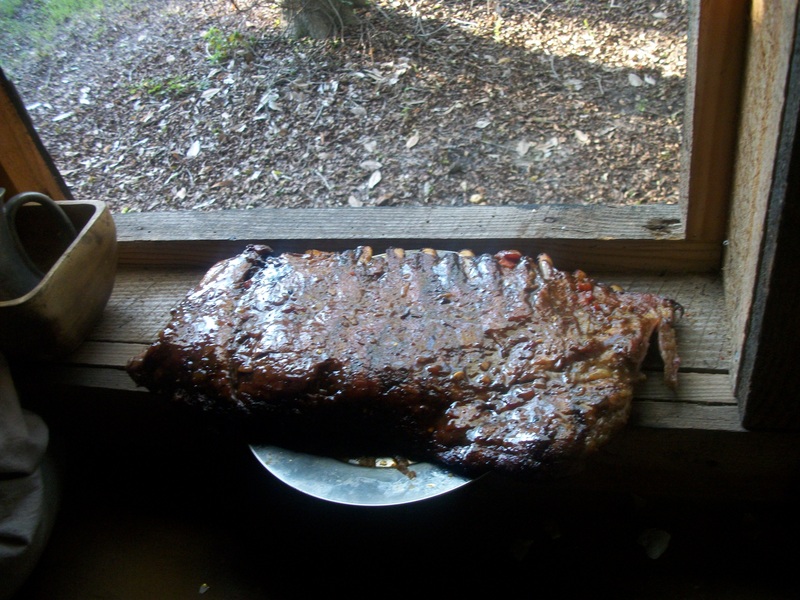 My favorite thing in all the world are beef ribs, what I once heard Steven Reichlen–I was his presenter at the 2005 Smithsonian Folklife Festival—call “Rabbi’s Ribs,” how appropriate. Oy, shver tsu tsayn a Yid! This recipe comes right out of the narrative of Mr. Wesley Jones, who was born enslaved in South Carolina in 1840. In his narrative, edited by Elmer Turnage of the Works Projects Administration of the 1930’s, he described his role as a pit-master at the many barbecues that served as social and business engagements for the planter class. Mr. Jones and many other men like him are the unsung creators of the Southern barbecue tradition. While some trace the origins of the word barbecue to a Carib term from the West Indies, “barbacoa,” or to French “head to tail” I follow linguists like David Dalby who point to words like “babbake” which means to “grill, toast or broil” from the Hausa language of northern Nigeria as evidence that barbecue has just as strong roots in Africa and African American culture. The Hausa and the neighboring Fulani have a long history of roasting, grilling and jerking the meat of their cattle, goats, sheep and game meats. I am taken aback by those who would re-assign the culture of barbecue to “good old boys,” and not acknowledge the roots of barbecue culture among Native Americans and African Americans. It was really creepy to hear a South Carolina barbecue shop owner tell Anthony Bourdain in an episode of No Reservations that barbecue was essentially the creation of the Edisto Indians and the German settlers. Given that the Edisto and most other Lowcountry indigenes were mostly driven to extinction or enslavement within about 45 years of English arrival, and given that the German settlers really only began arriving in masse after the 1730’s, How exactly did barbecue emerge out of near impossible marriage? Was the mustard in German culture and the mustard in South Carolina cue illustrative of a culinary link? Quite possibly! But were hogs–one of the most insidious “animals of empire,” on the Edisto menu, when they broke bread with Germans? Nah. I reject histories that are improbable, as much as I reject histories that reject our role in the roots. I strongly question such uncritical assumptions, especially when they leave Africans and African Americans outside of the history of barbecue. 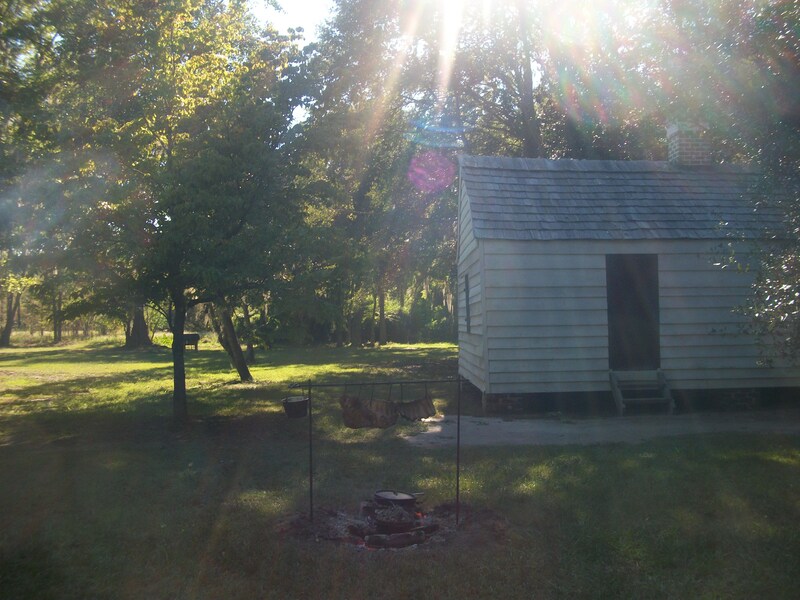 Africans and African Americans were not ancillary to the development of southern barbecue–they were central, lest we forget. 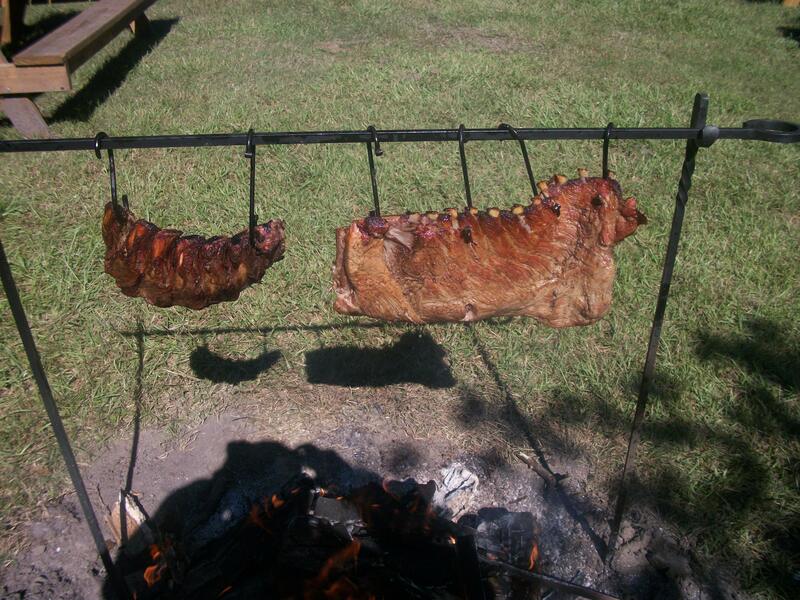 Barbecue was the brainchild of Black, Red and White……no one part can tell the whole story. I remember when I was a teenager and I went to a courthouse archive in Huntsville, Alabama where part of my family hails from. There was a beautiful mural or mosaic on one of the walls from top to bottom detailing Alabama history. At the bottom were the Creeks and Choctaws and Cherokees, going up towards the top–the settlers, the men of antebellum Alabama and then the builders of the New South, with not one single person of African descent displayed. That place illustrates the denial and obfuscation so common in Southern cultural history. This recipe is a recipe for the antidote. Thank you Mr. Jones! Optionals: Carolina Mustard Sauce–add 1/2 cup of brown mustard or more to taste, and a bit more sugar. Melt butter in a large saucepan, add onion and garlic and saute on a medium heat until translucent. Turn heat down slightly and add vinegar, water, the optional ingredients, and the salt and spices. Allow to cook gently for about thirty minutes to an hour. To be used as a light mop sauce or glaze during the last 15-30 minutes over the pit of coals and as a dip for cooked meat. This recipe is amazing. The NC style dipping sauce will be a family event tradition.